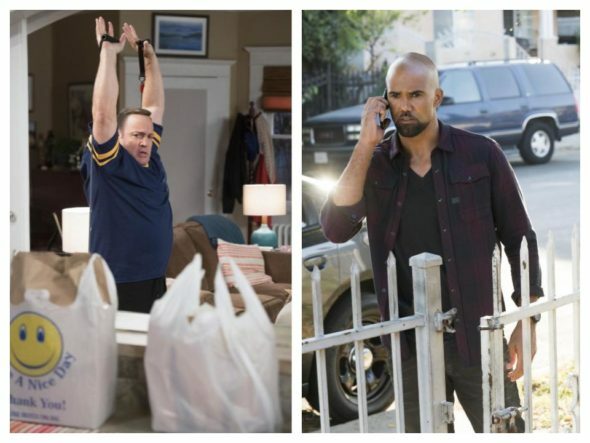 L-R: Kevin James in Kevin Can Wait season two (photo: David M. Russell / CBS); Shemar Moore in SWAT season one (photo: Monty Brinton / CBS). CBS has ordered two additional episodes for both season one of its new SWAT TV show and for the second season of Kevin Can Wait. The Tiffany Network had previously expanded SWAT to what it was calling a full season of 20 episodes, back in November. The latest order will give the police drama a more traditional first season of 22 episodes. Shemar Moore, Stephanie Sigman, Alex Russell, Jay Harrington, Lina Esco, Kenny Johnson, and Peter Onorati star. Meanwhile, Kevin Can Wait has been upped from 22 to 24 episodes. The family sitcom, starring Kevin James, replaced its freshman female lead, Erinn Hayes with James’ former King of Queens co-star, Leah Remini, in advance of season two. The CBS cast also includes Taylor Spreitler, Ryan Cartwright, Mary-Charles Joes, James DiGiacomo, Gary Valentine, and Leonard Earl Howze. The second season of Kevin Can Wait is averaging a 1.33 rating in the 18-49 demographic and 6.62 million viewers. Compared to season one, that’s down by 17% and 13%, respectively. The first season of SWAT is averaging a 1.04 rating in the 18-49 demographic and 6.36 million viewers. Find out how both series stack up against other CBS TV shows. On Friday, CBS also released its winter schedule and announced the Big Brother: Celebrity Edition, Instinct and Living Biblically TV series premieres, as well as the release dates for The Amazing Race season 30, and Survivor season 36. Although CBS has not publicized the new episode orders on its press site, Deadline has confirmed them. What do you think? Are you a fan of the SWAT and Kevin Can Wait TV shows? Do you think they deserved these additional episodes? Should CBS cancel or renew them for another season. Sound off, in the comments below. Kevin Can Wait: Cancelled or Renewed for Season Three on CBS? Kevin Can Wait: Has the CBS TV Show Been Cancelled or Renewed for Season Two? Kevin Can Wait: Season Two; Are the Cast Changes a Good Idea? I love SWAT. I was hooked right from the start. The storylines as fantastic. It makes you feel you are right their with the Seal Team. Please bring this back for second season. I’m a fan of Kevin Can Wait, so I hope they keep it, I really like this 2nd season.. I am really enjoying SWAT. The storylines are good and I love all of the characters. I’m glad they’ve extended the season. Of course another plus is that they kept the theme song to the original SWAT of many years ago. Very cool! Kcw? Well cbs had too. Because commented to the show long run. If the canceled now cbs network execs would admit defeat with show. Like many other cons shows past. They last longer then they should. but what they did killer off the main actor as they did. Cbs only tells us we don’t care about what people like.we care a out actors egos, doesn’t matter how bad actors they are….eg…Kevin James. We love the show- please renew for another season! Love that it is a family friendly comedy and adults as well as children can watch- there is so much trash on TV-it is refreshing to have a show with good clean comedy. Kevin and Leah have a great chemistry- they are so funny together! We look forward to watching every Monday night- just wish it wasn’t opposite The Voice.- but we always choose Kevin over the other shows. I absolutely love love swat,please keep it going.